1. Does anyone recommend a company for this, that has an online custom tool? 2. What should be the height of the letters for the typical mounting location on a C36 (side of the hull toward the stern). When going through the customizer at www.doityourselflettering.com, on first try I have 8.27"H x 36" wide, selecting the premium 3M Cast Vinyl. Is reflective better/must have? First, Welcome to the forum ! We wish you good luck with the purchase of your boat and hope you'll be well pleased. You've come to the right spot for answers and we all love to share our experiences. 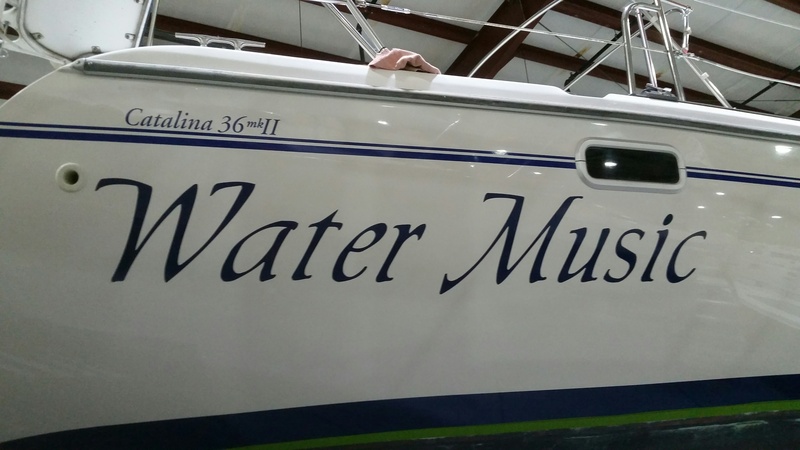 Depending on how long the old name has been on the boat, you are propably going to find it a bit difficult to remove the shadow of the old name since the older vinyl letters have protected the gel coat underneath them from rain, wind and sun & sand. Take it for granted that there probably will be a shadow. That being said, I'd get ready to design a new name and letter size (and perhaps a design) where the new lettering at least covers the old name. If you use a design along with the name lettering, it will most likely cover the former name's shadow and the eye will be drawn to the design and not the shadow. This is not as easy a job as many might think and you might ask a local sign shop for advice before starting. Many times auto parts store will stock the parts above. BoatUS and and local sign shops can supply you with letters in various fonts, but I perfer the local sign shops. If you screw up applying a (new) letter- the local shop can knock out another for you. Not that easy if you order the vinyl letters by mail. Great advice Bill! I'll start measuring the rectangle that the current name occupies, and look for a sign shop nearby. Thanks again. Hey Bill, what's an Oberdorfer Conversion? I saw that indicated in your signature block. The 99 MkII im buying has an Oberdorfer pump. Same thing? Quick answer - the original raw water pump on the Catalina 36 Universal engine was made by Sherwood, and was almost universally hated for dependability and difficulty of maintenance. Many owners replaced these with a more reliable pump made by Oberdorfer, which was almost a plug-and-play swap. There's tons of stuff on this conversion on this site, for example the following two links. You should count yourself lucky that you don't have go to through the conversion as your new baby has had it done already. Hopefully, you're buying from a former member and he's done all the cool upgrades already. Did he already do the chip tuning so that the boat will get up on plane? John, thanks for the insight (again). Chip tuning? No idea what you are talking about! The PO was/is a dedicated member of this forum and a fastidious yacht owner, so many upgrades have been done, to include fresh water head, battery charger and battery banks, all B&G nav/autopilot/radar/VHF-AIS/Oberdorfer pump/LED cabin lighting.... maybe more. I take delivery after the survey next month. In 2010, I used Boat US for our name: 12" tall x 39" long. $128 for both sides- Navy Blue, no sparkles. Been very happy. Take your time for the application and follow the instructions. Avoid applying on a day with wind! Having trouble attaching photo. Will try again later. Mike.... I agree 100% about the shadow you will have and trying to cover it with the new name. I too got mine from BoatUS without a hitch. To remove the old vynil I used a heat gun to soften it (not getting the gel coat too hot). With a small scraper you can usually get an edge to lift up and then big pieces peeled off. Took about 30 muinutes for the whole removal job on both sides. Again, previous post about doing it on a calm day (earlyAM or evening when the wind dies down). If the wind blows the vinyl once the carrier paper is off and it folds or hits the boat side, your toast. To remove the lettering use a 3M adhesive eraser wheel (check amazon, also made by other manufacturers but I've never used them). You put the eraser in a drill and in minutes the vinyl is gone. No heat gun, no scraping, no gel coat damage. If you need to use scrapers and adhesive removes (etc) you have not erased enough. Any minor stuff left over is a 'flitz', or 'cleaner wax' job. Remove any wax prior to new lettering. Oven cleaner seems to work as well for removal, along with very careful use of a razor. The homeport of the former owner was on the stern, there is still a very slight "shadow" of it, but almost impossible to see. The former name was on the aft topsides in the same place where the new name was put, so the "shadow" doesn't show up at all. 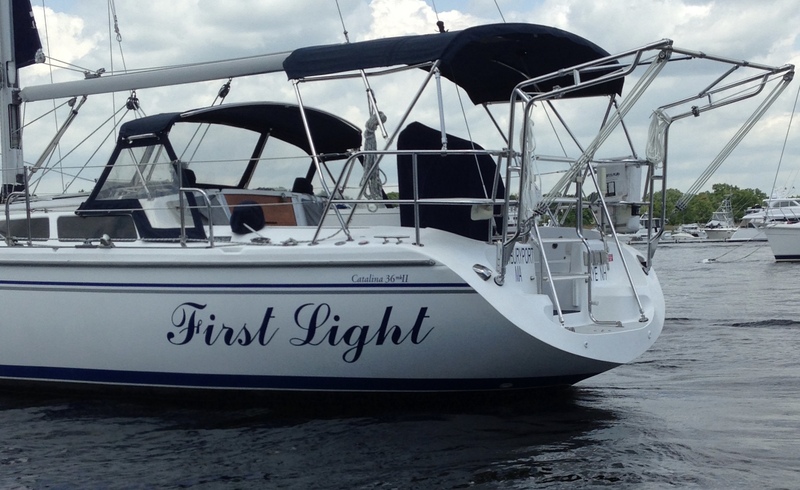 We got our name decals via West Marine, they have (or had, when we did it 9 years ago) a service that made them to order. Agree with the 3M eraser, and cleaning up with solvent. I ordered mine from BoatUS, which has an OK editing tool to order. 12" high, and name came out to just over a yard long. The original names from Catalina seemed to be all brushed script of some form, but it's your boat. You'll want to measure it out to make sure you avoid the stern cabin portlight on the starbord side. I did not mount mine myself as I was not confident. For a hundred bucks, the yard where I store her did a very professional job, and their folks do decals twice a day every day during springtime, whereas I'll mount something that big twice in my lifetime. Don't worry about the shadow - you'll never notice it once the new name's on. Remember, you don't read her name from 4 feet away like this photo, but from 500 yards away across the water, so relax. What's her name going to be? Hey John, thanks for the tips! The 3m eraser wheel seems to be the consensus. And I may enlist the services of the yard to put the decal on for me. Name is going to continue from my last boat - Jackfish GIrl, named after my grandmother who was from Jackfish, Ontario (now a ghost town on the north shore of lake superior). I was thinking of throwing a little subscript roman numeral "II" at the end of the name, as this is the second iteration. Reminds me of one of the many clever boat names I've seen over the years -- "My Last Boat II"
I don't know Kevin.......I like the name you've posted...quite elegant ! And I appriciated the aviation humor. Had not heard that one in years. 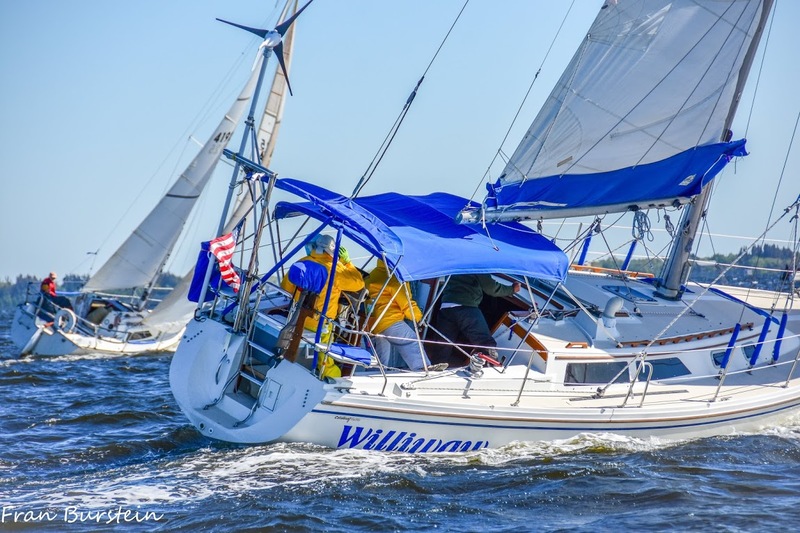 Seems like old pilots buy sailboats. You'll find a bunch of us here.